The King of Dholakpur has the royal Kohinoor. Three Ninjas are now after it. 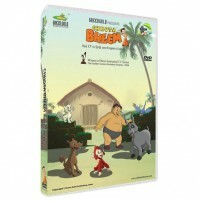 Bheem and Indumathi help bring the respected diamond back to the kingdom. Kalia possessed by the king Chandraverma who was killed many year ago in a war. After initial confusion, Bheem realizes taht Kalia is indeed possessed by the evil king and helps himto get rid of it. Also watch aliens walk into Dholakpur looking for some fun. Do not miss the action with well scripted humor!